In France, they call this soup Tout Fait or “Already Made” because it cooks so quickly. To make the preparation even faster, chop and wash the leeks the night before and wrap in plastic wrap for a fast after work meal. Chop leeks into one-inch chunks. Submerge them in a bowl of cold water to ensure that all the dirt between the layers is removed. Lift the leeks out of the bowl and rinse under cold running water. In a large stockpot, heat olive oil over medium-high heat. Add leeks and Herbes de Provence. Cook 3 to 5 minutes until leeks become translucent but do not brown. Add white wine, cook an addition 2 minutes, until the liquid reduces by half. Add the chicken broth and potatoes to the leek mixture. Bring the soup to a boil. Reduce to a simmer and cover. Cook an additional 15 to 20 minutes, until potatoes are tender. Season with salt and pepper to taste. 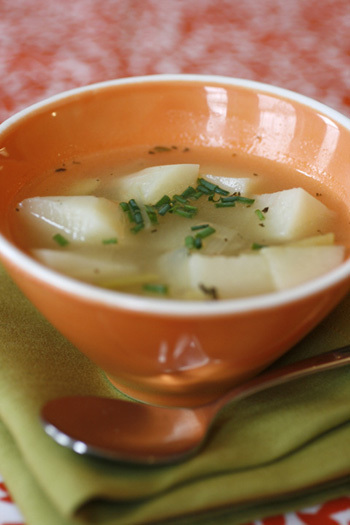 Serve in warm soup bowl with a slice of crusty French bread or whole wheat pita for a lighter meal.